So, there’s a good chance that a lot of you on this site already have a gaming setup, which is understandable. You most probably have a few friends who are thinking about jumping in soon, but don’t know where to get started… and that’s where this bundle comes in. Incredible Connection are running an insane bundle that hooks you up with everything you need to get gaming (quiet PS3 fanboys, we know it’s an Xbox 360 bundle). 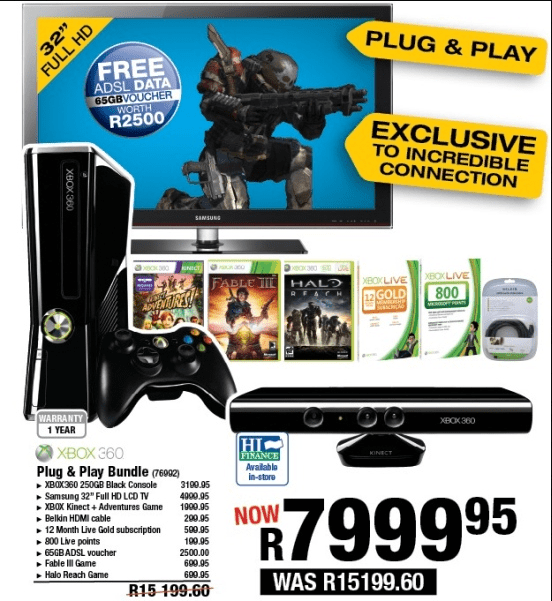 We’re talking console, LCD TV, games, vouchers, internet access… you name it. The price is also, well, well wicked. Hit the jump for all the info. All that for only R7999.95? That’s a friggin’ bargain if I’ve ever seen one, especially if it’s really all worth R15,000.00.